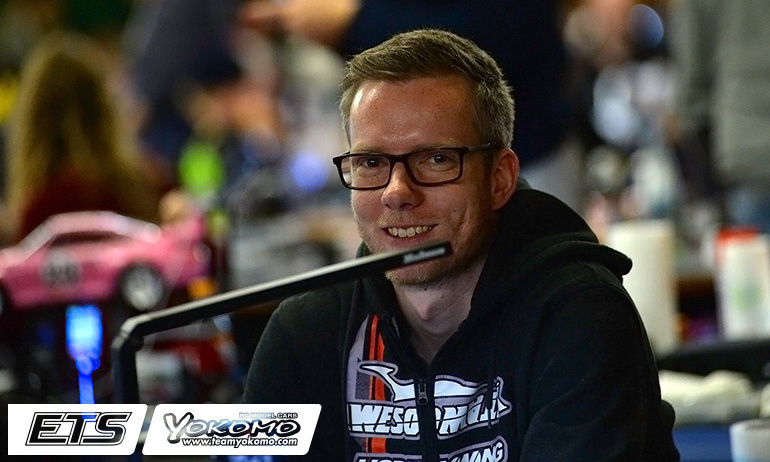 Having opened his title defence with a 6th place in Austria, Bruno Coelho made amends for the disappointing result by taking maximum championship points this weekend from the second round of the Euro Touring Series in Daun, Germany. 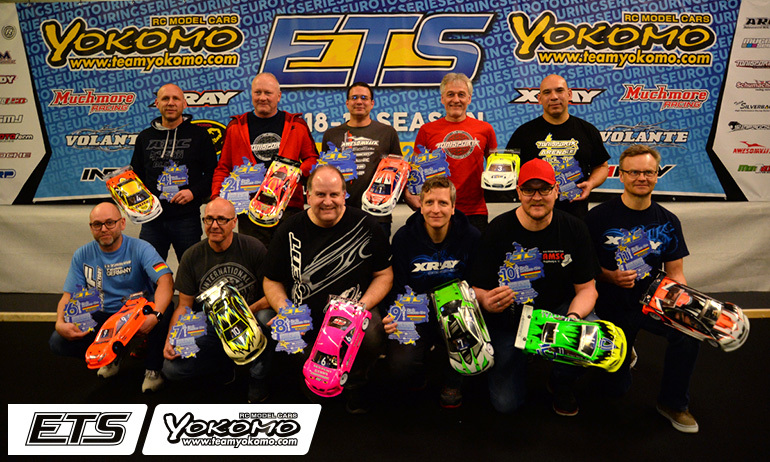 Winner of the same event last year, the Xray driver again secured the overall TQ and despite the best efforts of a very on form Freddy Sudhoff wrapped up the overall win in A2. 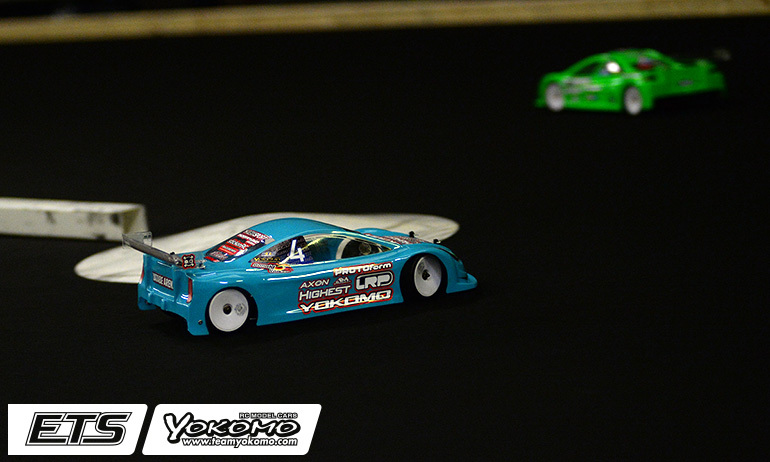 Sudhoff would secure 2nd overall with the win in A3 ahead of Christopher Krapp who avoided a first lap pile up – 2nd place promoting the Yokomo driver to fourth overall. 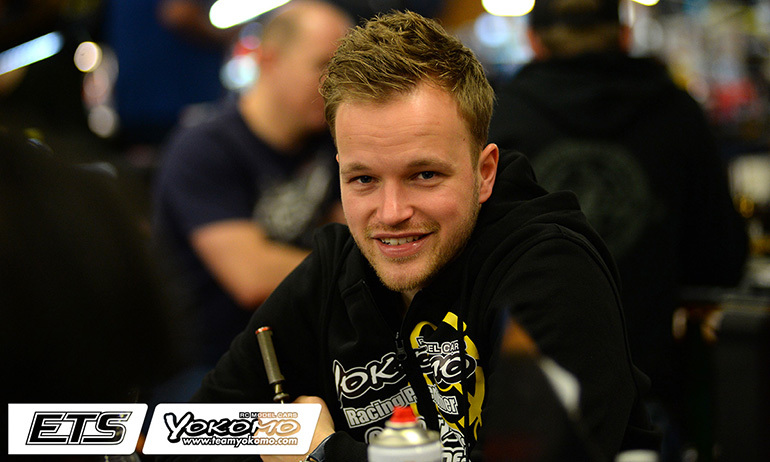 The incident was triggered by Ronald Volker making contact with Alexander Hagberg and with them crossing the loop to 7th and 9th respectively it was Volker who completed the podium with his 3rd and 4th from the first two Mains. Coming into the weekend as the championship points leader, the 3rd place is enough for Volker to retain that lead – the advantage still 3-points but now over Coelho. Coelho’s 15th ETS career win, the Portuguese driver said, ‘I’m super happy with the result. 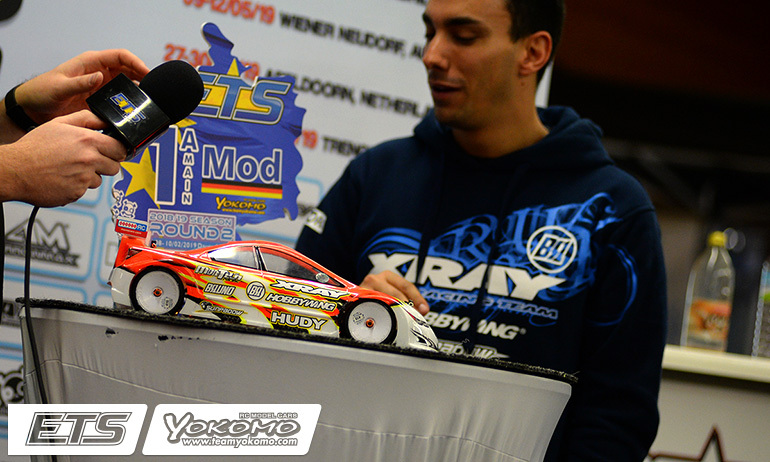 We all know on carpet I lose more so to get the TQ and win this weekend I’m super happy for sure’. 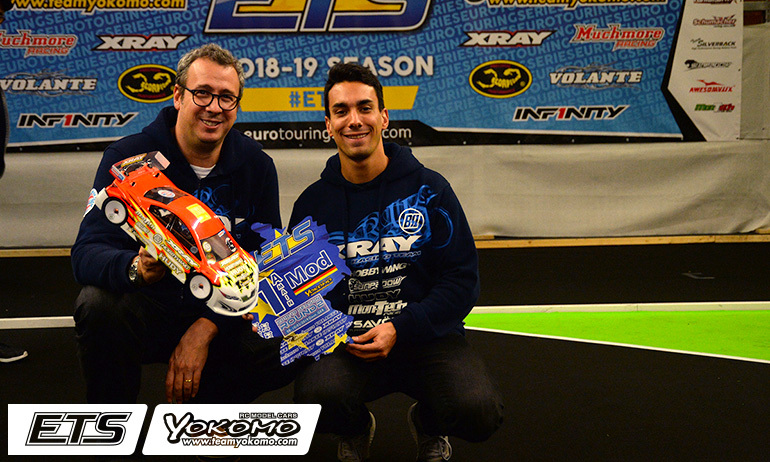 Enjoying EOS success at the same venue last weekend when he also took maximum points in 4WD Buggy, the World Champion added, ‘I’m looking forward to the next round in Madrid. 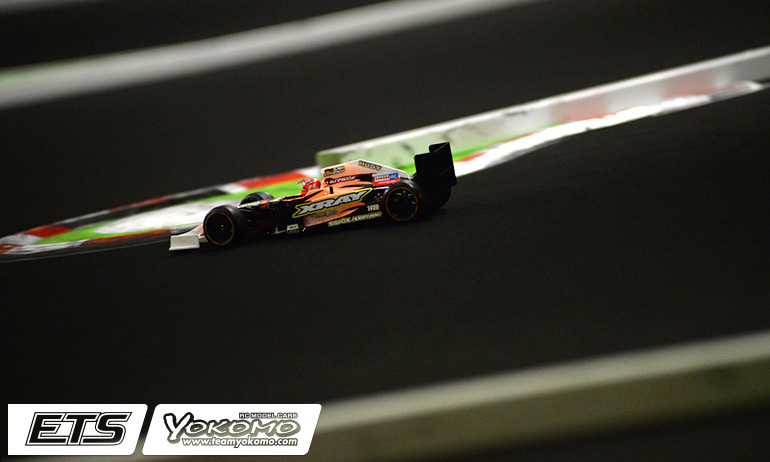 Two years ago I won there, last year I made too many mistakes, but I like asphalt and I like the track’. 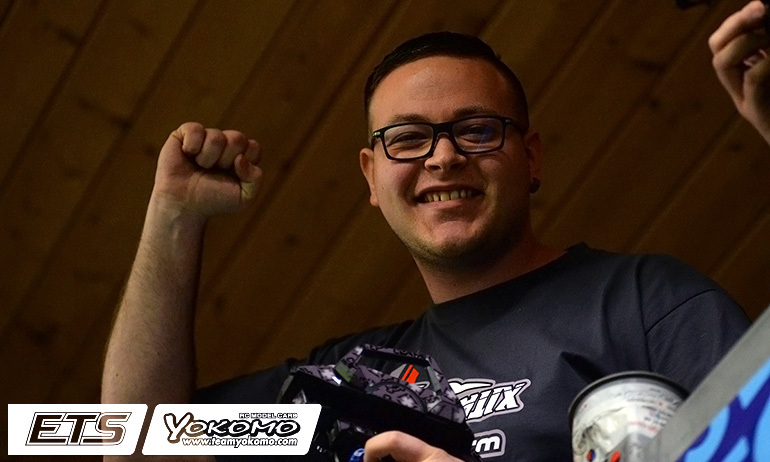 On the A-Main win that secured him his latest ETS victory, he explained, ‘It was a perfect final for me. I started very strong and immediately got a gap over Freddy. I don’t know if he was as fast as before or I was quicker, I need to check the lap times, but I was able to pull away and keep that distance between the two of us. He made no mistakes until the last lap. It was a great battle with him all weekend’. Summing up his valiant effort, his challenge on Coelho a welcomed change from the norm, Sudhoff said, ‘I am super happy with second. It is always great to be on the front row and finish on the podium against the professionals. I still have real job’. On his A3 win, the Awesomatix driver said, ‘I got lucky at the start. There was a huge crash behind me which meant I could just cruise around at 90%’. He added, ‘Overall it has been a great weekend for Awesomatix. Our cars were on the podium in all classes’. Asked if there was a single element that contributed to him being the only driver to take it Xray and in particular Coelho, the German explained, ‘We tested the mid motor car at Longwy and it suited my driving style so I was super confident with the car coming into the ETS. I am looking forward to racing outdoor now. Our car was good on asphalt last year and now we have the mid motor as another option’. An apologetic Volker said, ‘I feel sorry for having a small touch on Alex which ruined his race in A3’. The former champion continued, ‘he was slower than me and I was trying to take care but Yannic was right behind and I hit Alex. I benefited to make the podium but it was not how I wanted to get on the podium. Having started the weekend quite far of the pace, the German concluded , ‘this and Christopher’s 4th was the maximum we could have expected from the weekend but it could have been a more clean podium’. ‘Sure that was a lucky one’, was Krapp’s reaction to his A3 second place. He continued, ‘I made driver mistakes in the first so it was good to be able to finish of with a good result’. With 4th an improvement on his 9th at the season opener, the German said, ‘We improved the car and 3rd & 4th is an OK way to finish up the carpet season. 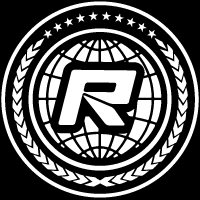 I’m looking forward to Madrid, asphalt is my better ground’. Behind Krapp, Marc Rheinard would be the best Infinity finisher ahead of team-mate Yannic Prümper and Viktor Wilck with Hagberg’s strong qualifying coming to little as he left Daun with an 8th place. In Pro Stock an intense and exciting A2 pushed the decider to A3 with Top Qualifier Max Machler repeat his A2 win to complete the perfect weekend. In A2 while the Awesomatix team-mate pulled clear at the front there was a great display of driving between Leo Arnold and A1 winner Simon Lauter there was contact with 3-laps to go. 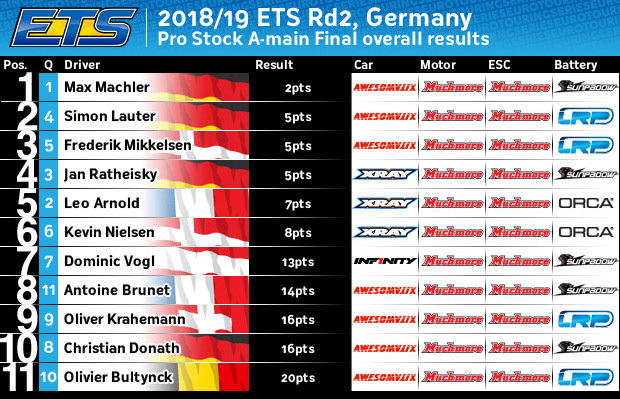 This allowed Jan Ratheisky to finish second setting the stage for a multiple driver showdown in A3 but Machler had it all under control and again led as the Top 4 remained up changed at the finish, Lauter having to recover some positions after dropping to 6th. In the end it was Lauter who secured second overall with Frederik Mikkelsen rewarded for strong runs in A1 & 2 with the final podium placing. 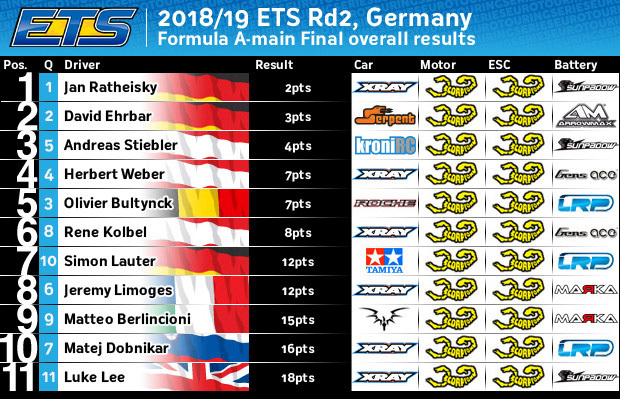 The top honours in Formula went to Jan Ratheisky, the Xray driver wrapping things up in A2 with his second win of the day ahead of season opener winning David Ehrbar. The Serpent driver would win A3 ahead of Andreas Stiebler, that second enough to secure Stiebler a podium finish ahead of Herbert Weber and Olivier Bultynck. 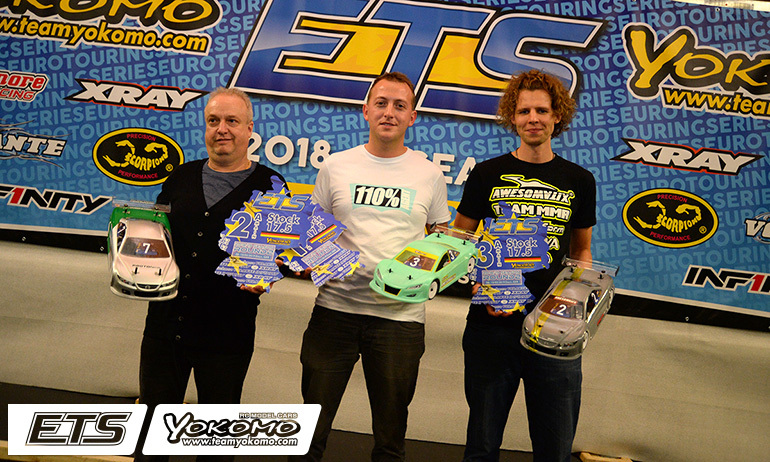 With the 40+ Masters winner decided in A2, ETS Vienna winner Alexander Stocker completing another maximum points haul, the win in A3 would secure Andreas Weyhoven the runners-up spot with Christian Drießle completing the podium on tie break from defending champion Thomas Oehler. 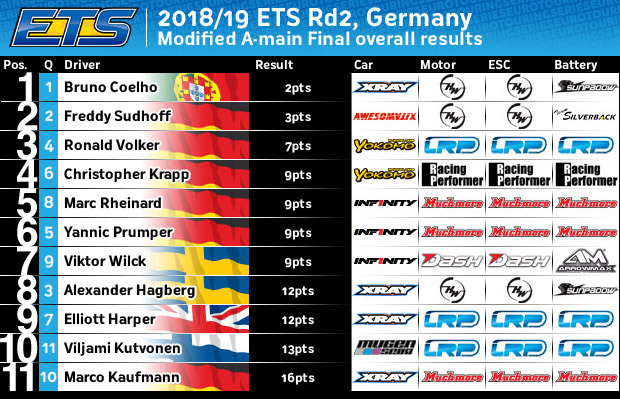 In the new 17.5 Stock class the decider came down to A3 but backing up his A2 win to take the last race ahead of Joachim Altenhof that is how they would also finish in the overall order. Winner of A1, Alexander Müller secured the final step of the podium.